Betty was born to Anna May Ruth of Grasonville and William Alexander Thomas, Captain Alex, on July 23, 1924. In 1925, Alex, a waterman since the age of nine, moved his family to Baltimore to make a better living by getting in on the city’s roaring-twenties industrial opportunities. A son, Harold, was born to the young couple striving to make a better life. The Great Depression eliminated thousands of those upwardly-mobile boomtown jobs. The Thomases came home to the Eastern Shore. Oscar ‘Sonny’ Schulz was born on Kent Island, in what was once called Devil’s Dominion, in 1933. His mother’s family, the Cloughs, were of local heritage, but his paternal grandparents had emigrated from Germany. Oscar and Maude, Sonny’s parents, had two children before Sonny was born. A sister, Charlotta, died at the age of four after eating a poisoned peach. The fruit had been sprayed with arsenic and Dr. Sattelmaier, another German émigré, was unable to get to the child in time. Sonny later learned that losing her daughter, “almost killed my mother.” Brother John was much older than Sonny and died at the age of fifty. Sonny’s father was an oysterman and a carpenter who struggled with his health. In World War I he’d survived a mustard gas attack, the long term effects of which were progressively debilitating. Sonny was eleven when his father died. Despite the financial difficulties he and his mother faced, Sonny graduated high school, a feat not necessarily common for farm boys and the sons of watermen. Mother Maude Schulz was industrious, too. She was employed by the Thomas family. The Thomas’ owned a little business at Kent Narrows. Downstairs was a restaurant. Upstairs were four guest rooms. They called the place Fisherman’s Inn. Betty wrote in her book that the original Fisherman’s Inn “was just a small building with a small living room and two bedrooms on one side. The other half of the building served as a dining room. The kitchen was where we ate. It had a small front porch entrance and three gas pumps out front, selling Atlantic gasoline. Route 18, the only road crossing from the Island to the Narrows, was just outside the front door. In 1931, during the heyday of Kent Narrows’ status as a serious player in the Chesapeake Bay’s seafood harvesting business, Alex Thomas opened an oyster packing house. Despite early indicators of potential success, the Depression was worsening and money remained tight for years. As when he originally purchased his property, no bank would loan Alex the money to expand, so once again a private investor, a Queenstown contractor named Johnny Cole, lent what was needed to build that upstairs section with the 4 guest rooms. Betty took over the restaurant part of the family business when her parents separated in 1945. Additional Kent Narrows acreage was purchased in 1943, 1944, and 1951. Betty and Sonny married in 1956. Their first son of three, Andy, was born in 1959, followed by Jody in 1960, and Tracy in 1963. Betty stayed involved with her family business while Sonny worked on the water. Eventually, her father divided his Kent Narrows property between Betty and her brother, Harold. It was about that time, Betty wrote of the original Fisherman’s Inn, “We were outgrowing the old building which had a lot of problems after being added on to so often. Sonny thinks about that memorable day for just a moment and then adds, “We burned down December 23rd, 1980. “…Someone riding by late at night saw smoke,” Betty wrote, “coming out of the roof and called it in. Betty wrote, “At first the fire seemed to be contained, though the odor of smoke was prevalent. No one saw any flames. It later turned into an inferno. When the firemen broke through the roof, and the air got in it sent their ladders everywhere. 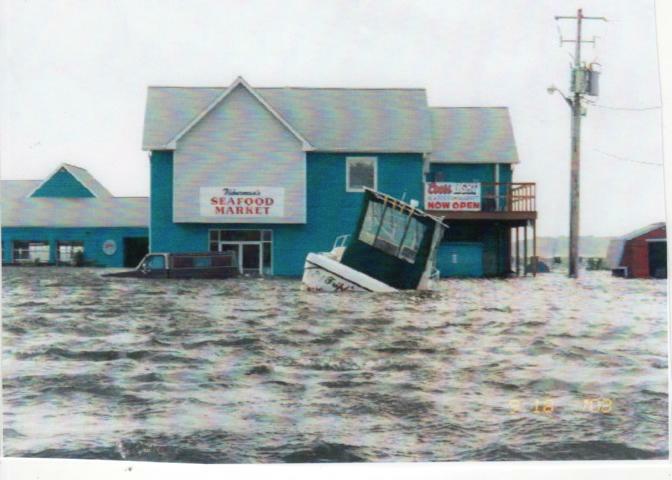 Today’s Fisherman’s Village – Fisherman’s Inn, along with Fisherman’s Crab Deck and Seafood Market, which opened in July 1991 – employs about 200 people during the summer, and half that through the winter months. The weekly payroll is in the tens of thousands of dollars. And that’s a lot of money generated into the community from what was once, back in the Great Depression, a little family business. The seafood dish, corn and beer is enough to draw anyone!! Being as I can eat my weight in seafood – you can see why I’m focusing on that picture!! 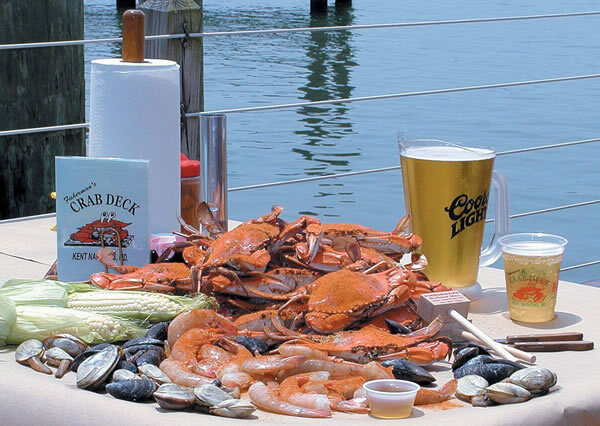 Hard to concentrate when a picnic table full of Chesapeake Bay region goodies is right there in front of your eyes! Thank you Jack! I always look forward to any comment you leave on the blog and I always appreciate your support! You always have such great insight and stories. And I am going to ask the boys about that oldest restaurant in MD thing! Hope to see you soon! I remember my father, Ernie Wolff, helped build the Fisherman,s Inn when he managed E.S. Adkins in Centreville. He was proud of the project. Thanks for reading and commenting, Scott!